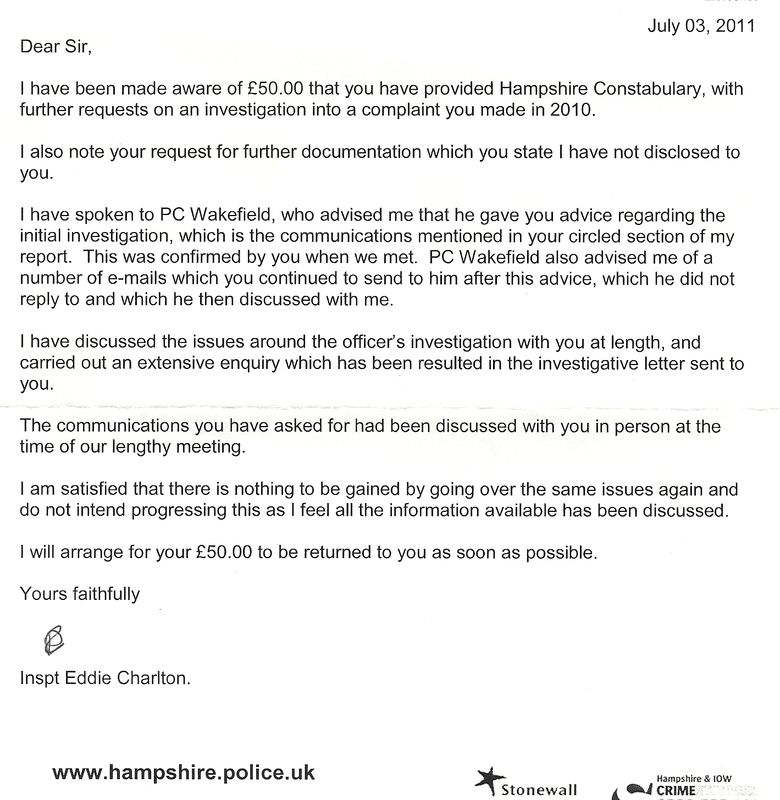 I had originally complained to the IPCC because the police had ignored my suspicions of theft. However you can see in the IPCC report (below) that the police have come up with a different story. They say that PC Wakefield responded to my suspicions and that had steamed ahead with my suspicions despite receiving this letter from PC Wakefield explaining to me why the letter had not been stolen. I had never received this letter but it obviously offered me what I want - a response to my specific report of my suspicions of theft of a recorded delivery letter. I asked Inspector Charlton (by recorded delivery letter - receipt above) to send me a copy of PC Wakefield's letter. He ignored me. Latterly in sheer desperation, I sent the police 50 pounds in cash to be used as expenses in providing me with a copy of PC Wakefield's letter. The request from myself, stated in crystal-clear English, that I wanted a copy of the letter in question has been interpreted by Charlton as a request for further investigations. This has been a continous problem - it's like talking to a foreigner with little grasp of English. The statement that Charlton and myself had discussed the contents of the said letter on a previous occasion is pure fantasy. If you have managed to get this far, you will realize that I believe there is another reason why it would have been impossible for Charlton to have discussed the contents of the letter on a previous occasion - namely that this letter does not exist.